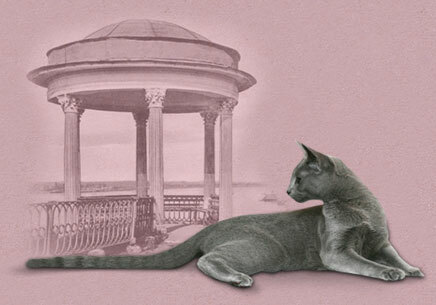 Welcome to the website cattery of Russian blue cats, located in the ancient Russian city of Yaroslavl. About Russian Blue I dreamed a few years. When I was still a little girl, my grandmother lived in the Tambov region and she had cat with a dense short gray fur and pale green eyes. It was the most courageous, intelligent and beautiful cat that I saw. She was great mousetrap, beautiful mother to kittens, independent and gentle at the same time. When I grew up and and became the head of my family, I wanted a cat, but only special a cat - elegant, with plush blue wool and extraordinarily intelligent. It was several years before our children have grown up, and in 2011 we had the first cat breed Russian Blue - Glen Ellen of Happy Song of the Latvian nursery Happy Song. And in early 2012, came to us and second cat from the same kennel - Necole of Happy Song. By this time I decided to seriously start breeding this wonderful breed - I'd like to Yaroslavl and other cities have more Russian Blue kittens to cats of this breed at the show and make people happy with their beauty. Russian blue cats surprisingly beautiful graceful creatures with sparkling silvery fur and green eyes. They are very active, independent, attached to their owners, but with strangers often wary, get along well with other pets, try not to let the claws in games with children. This is a clever, tidy cat, easy to care for the hair, but in need of affection and attention of the owners. Well, when the house live two Russian blue cat or cats - they have the opportunity to play with each other at any time, regardless of employment owners. Our nursery Russian blue cats Yaroslavl is small and very young, but we work with established nurseries in the city of Ivanovo and Vladimir. Now our cattery is registered in the system WCF. We are very devoted to our pets, they are full members of the family. Born in our Russian Blue kittens grow with young children, come out of our houses are completely socialized, vaccinated, with the document of origin (metric or pedigree) and contract.